A solution-oriented approach and process up-gradation are two important focus points for key players operating in the Europe automotive parts remanufacturing market, as highlighted in a new report published by Persistence Market Research titled “Automotive Parts Remanufacturing Market: Europe Industry Analysis and Forecast, 2016–2024.” After an extensive study of the market, the analysts have noticed that it is necessary to strengthen partnership with sales and distribution partners for better output. Further, they have observed that to meet the requirement of new and advanced parts for reconditioning and testing, the up-gradation of the remanufacturing process is essential. While differentiating strategies, the expert team of analysts have found that long-term strategic partnerships with raw material suppliers may provide future growth opportunities for remanufacturers. This report consists of an overview of the Europe automotive parts remanufacturing market in terms of value. 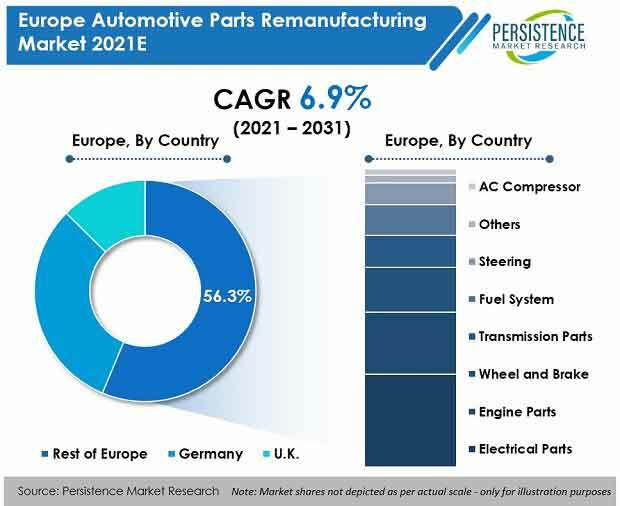 In addition, it also includes analysis of key trends, drivers and restraints from the supply, demand and economy side, which are influencing the Europe automotive parts remanufacturing market. Impact analysis of key growth drivers and restraints based on the weighted average model is included in this report to facilitate clients with pertinent decision-making insights. This report provides a detailed analysis of the automotive parts remanufacturing market across various countries in the Europe region. It provides a market outlook for 2016–2024 and sets the forecast within the context of the automotive parts remanufacturing market including service offerings in the market. This study discusses key trends within countries contributing to the development of the market, as well as analyses the degree to which drivers are influencing this market in each European country. Insights from this extensive market study are provided with an objective to enable market players to plan their differentiating strategies capable of evolving with the changing market landscape. A detailed analysis has been provided for every segment in terms of market size analysis for automotive parts remanufacturing across the different countries. This exclusive report provides a detailed analysis covering key trends, absolute dollar opportunity and BPS analysis. The report concludes with key industry recommendations from both the demand and supply perspectives to companies planning to foray into the Europe automotive parts remanufacturing market. Market volume is inferred through in-depth secondary research and validated from industry experts through primary interviews. Each interview is thoroughly analyzed and average market volume is deduced and reconfirmed prior to incorporating in the report. The price of remanufacturing components is deduced on the basis of component type, where the average price of each component type is inferred across all the five assessed countries. The market value of the Europe automotive parts remanufacturing market is thus calculated from the data inferred from the average selling price and market volume. For the eight year forecast of the Europe automotive parts remanufacturing market, various macroeconomic factors and changing trends have been observed, giving an idea about the future of the market. Other important factors considered to arrive at market forecast include the size of the current market, data from the demand side and the supply side and other dynamics shaping the scenario of the Europe automotive parts remanufacturing market. In the compilation of the report, the forecast is conducted in terms of CAGR, while other important criteria such as year-on-year growth and absolute dollar opportunity have also been incorporated presenting the client with crystal clear insights and future opportunities likely to emerge in the Europe automotive parts remanufacturing market. Germany, being a mature market with various remanufacturers and international brands was estimated to hold more than 30% value share of the Europe automotive parts remanufacturing market by the end of 2016. The automotive parts remanufacturing market in Germany is expected to create total incremental opportunity of more than US$ 3,000 Mn between 2016 and 2024, representing close to 40% of the total incremental opportunity over the projected period. The Germany market is estimated to create incremental opportunity 1.8X times that of the U.K. market during the forecasted period. The Germany automotive parts remanufacturing market is estimated to dominate the Europe automotive parts remanufacturing market owing to large local parts remanufacturers present in the country. The Germany market is expected to register a CAGR of 7.9% over the forecast period. The Germany automotive parts remanufacturing market is estimated to gain more than 100 BPS between 2016 and 2024 owing to large local manufacturers and enhanced consumer loyalty towards them. The Germany automotive parts remanufacturing market is expected to expand due to a broad range of international car brands and ever increasing passenger cars production and usage in the country. Besides, government regulations are expected to focus on gradually promoting resource productivity. Over the next few years, European regulations are likely to include tougher environmental standards for products and ways to price ecosystem services and resources. Stringent government regulations pertaining to waste management in Germany are expected to boost the growth of the automotive parts remanufacturing market in the country. Growing population and urbanization in Germany will lead to an increase in demand for materials, water, land and energy to fulfil individual needs. Consequently, there will be great pressure and potential disruption might be witnessed in their supply as resources will be subjected to greater competition within the country. Companies with an experience in manufacturing products with fewer resources are expected to be more resilient to these factors. The effect may also lead to a rise in prices of resources, which may become more volatile over the forecast period. Rising awareness among consumers towards eco-friendly products is another factor which is fueling the growth of the automotive parts remanufacturing market in Germany. Consumers’ demand for eco-products or sustainable products that use fewer materials or less energy is growing with rising awareness about the environment among consumers. One of the major factors likely to drive the automotive parts remanufacturing market in Germany is the higher profit margin associated with the German aftermarket rather than the business of make and sale. Minimal input cost of the remanufacturing business due to the minimum charge of discarded products makes this business highly lucrative. Consumers in Germany are also attracted towards remanufactured products as they offer the same warranty at a low cost as compared to the original product. The steering segment is estimated to gain more than 50 BPS between 2016 and 2024 and is expected to expand at a CAGR of 9.4% over the forecast period owing to the demand for steering pumps and gears over the forecast period. The passenger car segment is expected to be equally attractive in the Germany automotive parts remanufacturing market in terms of market share and incremental opportunity, owing to a major car production hub in Germany and increasing average life of vehicles in the country. The segment is estimated to gain around 50 BPS between 2016 and 2024, owing to the presence of local remanufacturers and strong consumer awareness.